Walmart is enforcing their no pets policy in Sebastian, Florida. SEBASTIAN – Walmart has been tightening rules on what it considers to be a service animal. The retailer will soon ban “comfort and emotional support animals” from its store in Sebastian. Walmart will now add the policy to its Indian River County stores, which should be happening very soon. Overall, most people have no problem with legitimate service animals inside Walmart. However, it’s crossing the line when people bring their pets into the store. 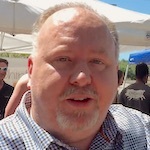 Some customers allege that people have found loopholes and have taken advantage of the system. Some restaurants and bars in Sebastian have banned pets. People are becoming more pet-friendly and pushing their limits when taking their pets in public. The Tiki Bar & Grill started a no pets ban long ago. The management says that pets disrupt service when people are trying to eat. 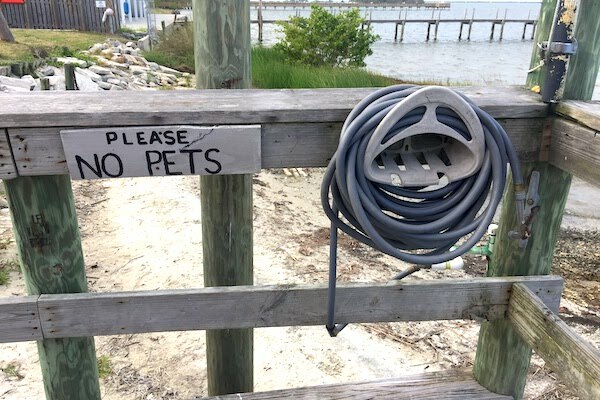 They love animals, but not irresponsible pet owners. Some animals have eaten food off of other customer’s plate and asked the establishment to pay for it. They’ve had dogs dig and potty in the sand where patrons sit. No pets at Tiki Bar & Grill in Sebastian. At Captain Hirams Resort, they do allow non-service animals to sit on the decking by their marina. However, no dogs are allowed on tables, benches, or in the sand at the Captain Hirams Sandbar. They try to accommodate guests who have pets and service animals. One reason is, the two hotels owned by Hirams (The Best Western Plus and the Captain Hirams Hotel) are both pet-friendly. Local businesses don’t have the option to ban service dogs; it’s the law. But emotional support animals are not service animals under the ADA law. The Americans with Disabilities Act’s definition of a service animal is “a dog that has been individually trained to do work or perform tasks for an individual with a disability. The tasks performed by the dog must be directly related to the person’s disability,” according to the ADA’s website. Walmart made its recent decision after problems arose when people expanded the definition of comfort and support animals. Many of them claim having an animal by their side is a significant health benefit. There have been a few that relieved themselves in stores. Delta Air Lines had to become more strict with emotional support animals. During the past three years, the carrier saw an 84 percent increase in incidents involving animals. The company changed its policy after one passenger attempted to claim a peacock as an emotional animal. 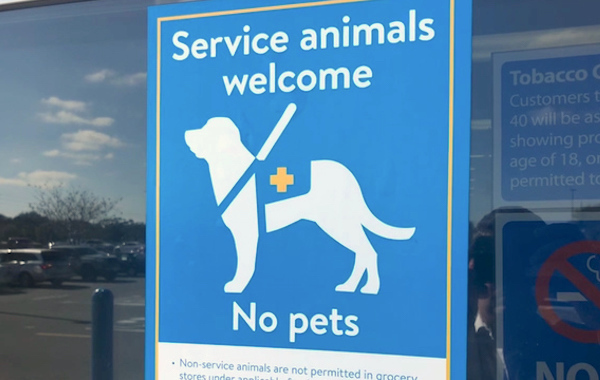 Walmart isn’t changing its policy on service animals, but they are adding new signage to remind customers of its position. “We welcome service animals in our stores and serve customers that rely on them as part of their daily lives,” a spokesperson said. Walmart associates will usually determine whether an animal is a service animal by asking the owner. Service animals also typically wear distinctive vests and harnesses.